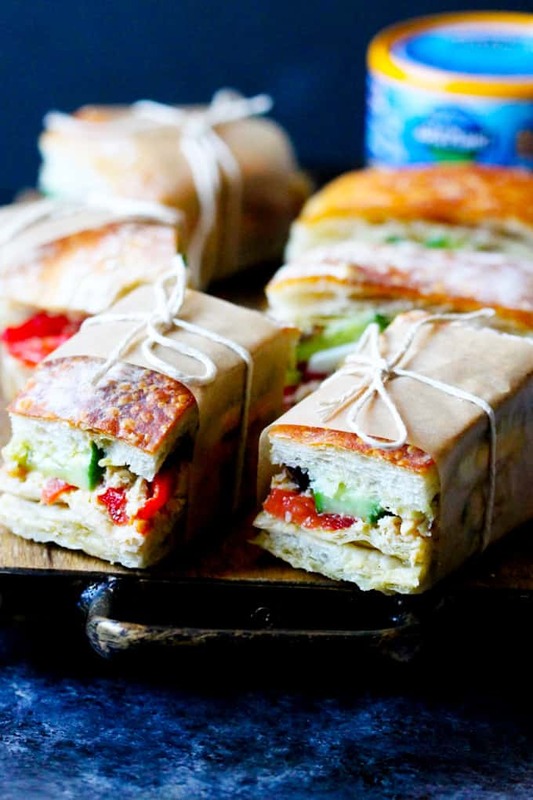 Pan Bagnat is a classic French sandwich that is often served at picnics or other gatherings. The idea is to stuff the bread with the best quality tuna, vegetables, eggs, and dressing. Let it sit in the refrigerator compressed for a couple of hours, and then, cut it up into individual servings and feed it to your crowd. For this Pan Bagnat recipe, I partnered up with Wild Planet Foods, the producer of the top-ranked tuna for sustainability by Greenpeace. Pan Bagnat literally translates to “Bathed Bread” as the bread here actually is intended to soak up all the flavors. This French sandwich is typical to the Provence region of France. It can be found in every market or bakery in the area. 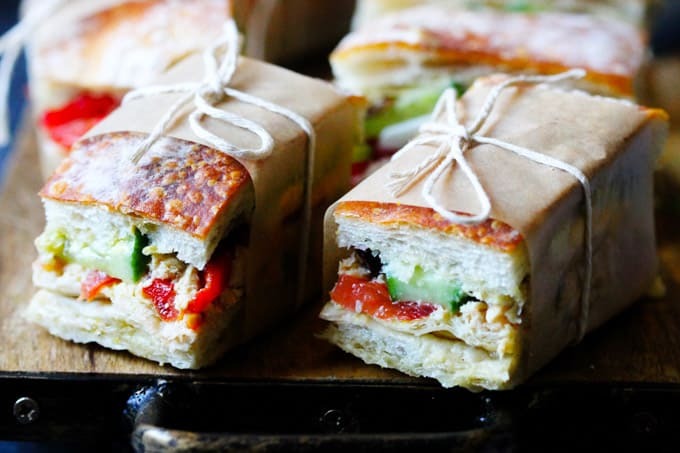 It contains the typical Provencal ingredients of fresh tomatoes, peppers, cucumbers, anchovies, and tuna. It’s basically Salad Niçoise on bread. 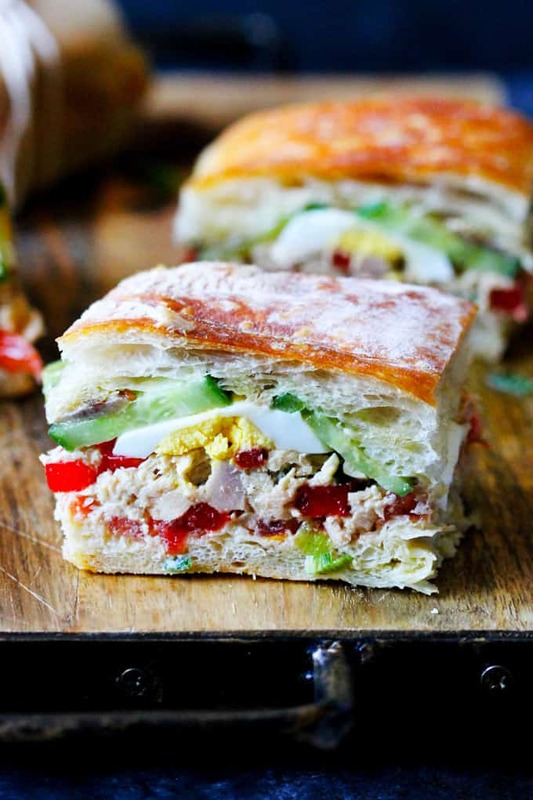 This Provencal tuna sandwich is traditionally made with a round rustic bread. It is stuffed with all of the ingredients, pressed, chilled and served to feed a crowd. The ability to feed so many makes sense when you consider that you’re filling up a whole loaf of bread. Mind you, good rustic bread is not always easy to find. So, feel free to substitute with a ciabatta as I did in this recipe. 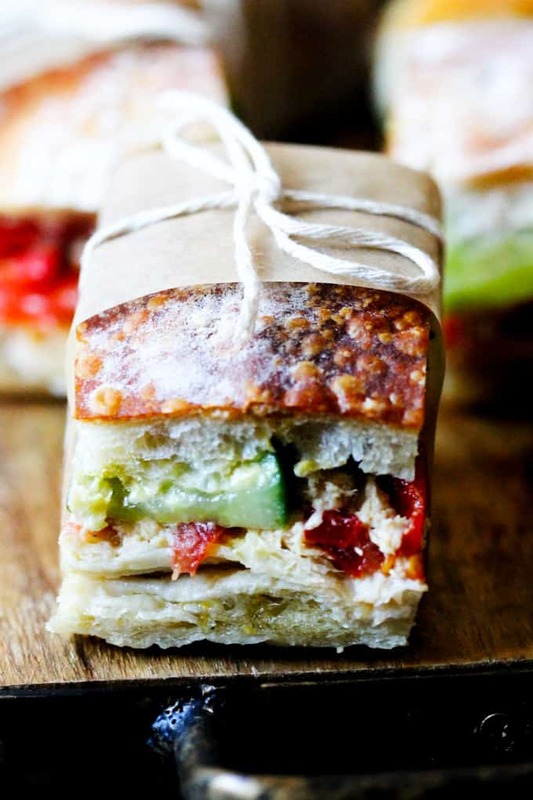 Also, because you need to make this sandwich ahead of time, it’s a perfect option for a picnic. You can make it the night before and the next day just pack it and take it with you. As I write this post, we’re approaching spring in New York and this sandwich recipe couldn’t come at a better time. 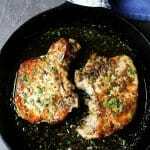 Why did I use Wild Planet Albacore Tuna for this Pan Bagnat Recipe? 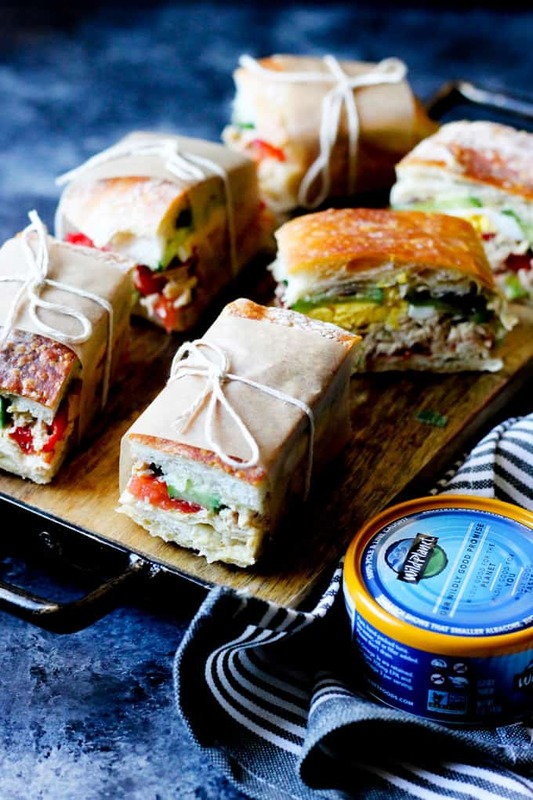 I chose Wild Planet Albacore Tuna for this French sandwich recipe because I love how it tastes and I love how serious this brand is about our health and the health of the planet. 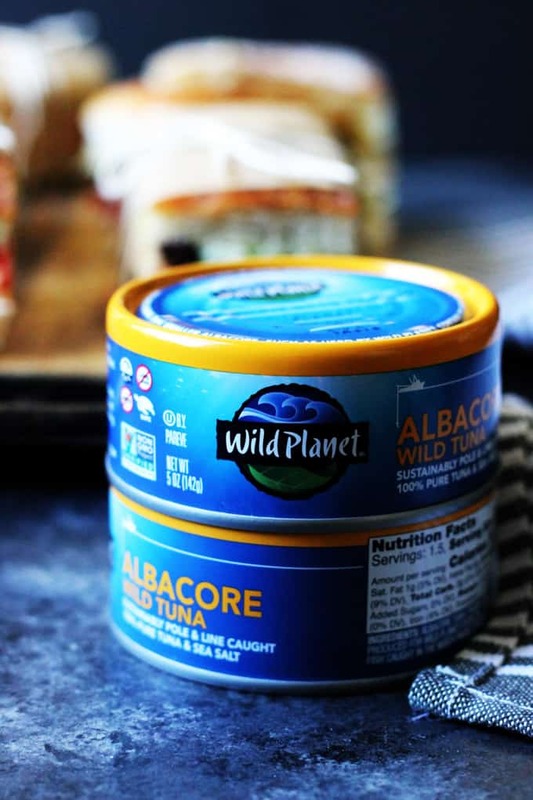 Before I even partnered up with Wild Planet Foods to make this recipe, I had a stock of Wild Planet Albacore Tuna in my pantry. I always bought it in bulk at my local Costco. I think it says it all. If you want to know more, then head over to the Wild Planet Foods website to read all the important information. Alright, let’s get back to this fantastic Pan Bagnat recipe. Here’s a list of the ingredients that are needed to make this French sandwich. You can always skip whatever doesn’t fit your palate or add other ingredients that you’d like. This list is simply meant to provide you with a grocery list. For exact measurements, please scroll down to the printable recipe at the bottom of this post. 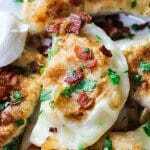 This is a super easy recipe to make. In this paragraph, I want to visually show you how to make Pan Bagnat. 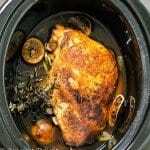 Scroll down for a full printable recipe with all the detailed instructions and nutritional information. Step 1. Place your eggs in a pot with cold water. Boil your eggs for about 10 minutes from the time the water starts boiling. Remove the eggs and cool them off in cold water. Step 2: Place your Wild Planet Tuna in a bowl, mash it with the fork. Then thinly slice peppers and chop scallions. Add to tuna and mix all together. Step 6: Place the sandwich in between two baking sheets, and place something heavy on top to weight it down (cast iron skillet, brick or heavy books). Put it into the fridge. Refrigerate for at least 3-4 hours or overnight. Step 7: Remove from the fridge and cut off the edges of the bread. Then cut the bread into 2 ” sandwiches and pack for a picnic. Place your eggs in a pot with cold water. Boil your eggs for about 10 minutes, from the time the water starts boiling. Remove the eggs and cool them off in cold water. Place your Wild Planet Tuna in a bowl and mash it with a fork. Then thinly slice peppers and chop scallions. Add to tuna, and mix it all together. In a separate bowl, combine olive oil with mustard and mix together (this mixture can stay a little lumpy). Cut your bread horizontally and scoop out some of the bread from the inside (you'll want to create sort of a boat that will hold all the ingredients well together). Brush oil/mustard mixture on top of your bread, cover the sandwich and wrap in plastic foil. 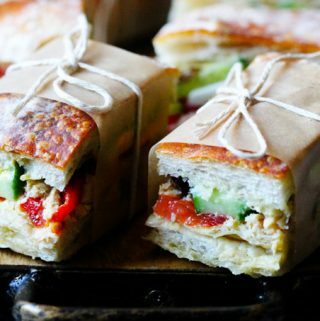 Place the sandwich in between two baking sheets, and put something heavy on top to weight it down (cast iron skillet, brick or heavy books). Place it into the fridge. Refrigerate for at least 3-4 hours or overnight. Remove from the fridge and cut off the edges of the bread. Then cut the bread into 2" sandwiches and pack for a picnic. Traditionally, the French would use round rustic bread. However, I sometimes have difficulty finding it. So, for me the easiest substitution is a ciabatta. 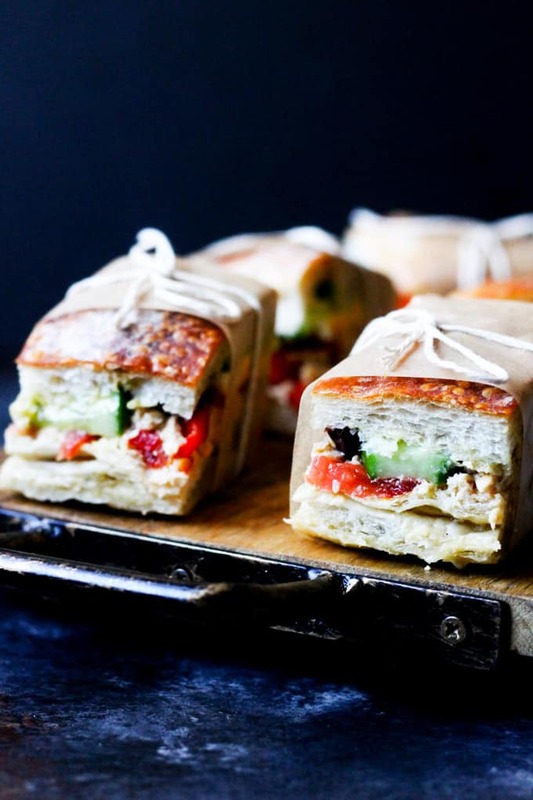 You can also see that it lent itself well to being portioned into these small super cute picnic sandwiches, but if you find an approximately 7" rustic bread and want to go authentic, feel free to use it. If you can’t find Niçoise olives you can substitute with the more common Kalamata olives. 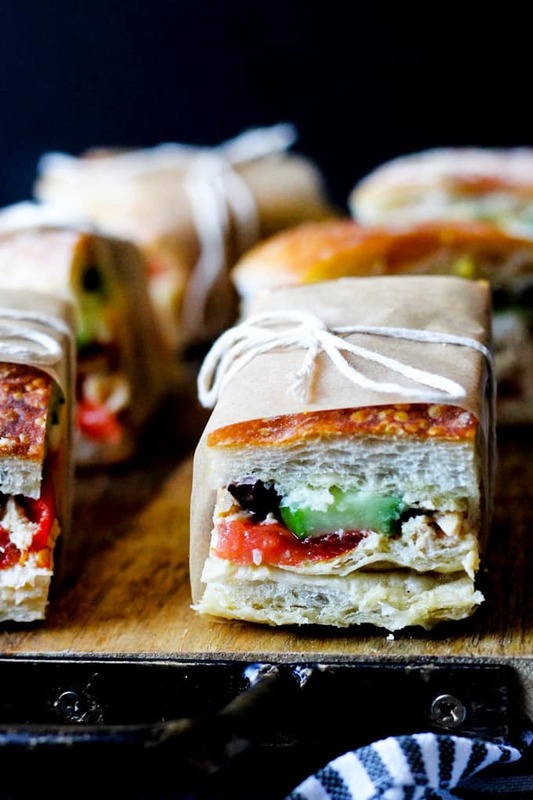 These sandwiches are so pretty. I also love that they can be made ahead of time and will be perfect a couple of hours later. These would be great for a brunch or shower. Yum! Such beautiful sandwiches! These sound absolutely perfect for springtime picnics. I love how easily they come together too. One of my favourite sandwiches! Your photos are also gorgeous btw! I just love a classic sandwich like this! And such helpful notes on the substitutions – I actually always prefer kalamata olives myself, but everything else is PERFECT the classic way, at least in my book! This is my favorite tuna brand! These sandwiches look lovely, can’t wait to try them!